If you’re in Australia, you may have heard about a brand new TV show coming to Channel Nine this month – The Great Australian Bake off! The show brings together ten of Australia’s top home bakers and puts them through a series of challenges to bake the most impressive and imaginative sweet treats. Hosted by Shane Jacobson and Anna Gare, and with contestants’ dishes being judged by Dan Lepard and Kerry Vincent (whose nickname is “the Simon Cowell of cake”! ), The Great Australian Bake Off should be a real “treat” to watch! The first episode airs tomorrow evening, 9th July, at 8pm on Channel Nine. And about this Profiline PushPan giveaway? The PushPan is the first of it’s kind, with a patented silicone-seal loose base. The pan will be featured throughout The Great Australian Bake Off series, where you’ll see contestants literally pushing their cakes out of the PushPan in perfect shape and consistency every time. How does a PushPan work? Imagine a loose‐based, completely watertight and leak‐proof cake pan. 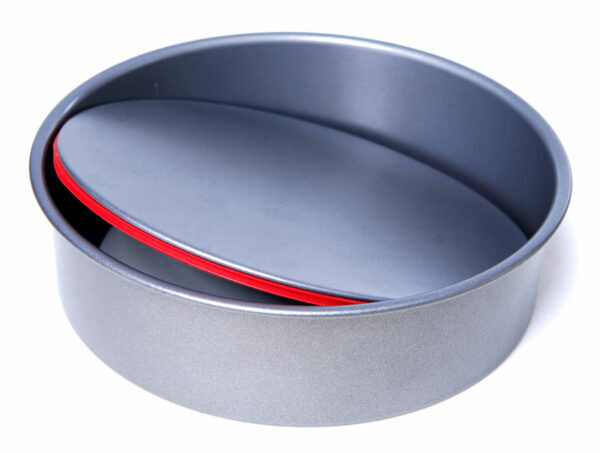 Each Profiline PushPan has a uniquely integrated silicone seal on its loose base that guarantees no cake mixture will find its way out of the pan. 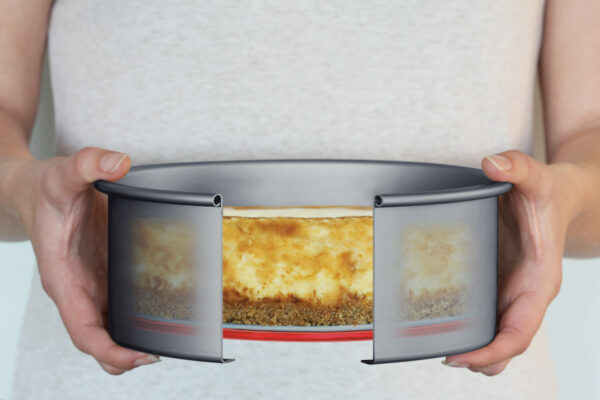 And since not a drop of water can get in either, the PushPan is ideal for baking a cheesecake in a water bath, without the worry of fashioning a lining or wrapping your pan in foil first. Like The Great Australian Bake Off contestants, Australian home bakers are discovering the silicone‐seal and IILAG Swiss Technology non‐stick coating on every Profiline PushPan means pushing out a cooked cake has never been simpler: after your cake has cooled, place the PushPan on a tall can and push down evenly to glide the side away from the base. Remove the cake from the base and it’s ready to ice and serve. Thanks to its unique integrated silicone‐seal (FDA approved), it’s suitable for cakes, cheesecakes, quiches, jelly, pies or even ice cream desserts of any depth. It comes in six sizes, including 12cm, 18cm, 20cm, 22cm, 24cm and 26cm. Check out pushpan.com.au for more details. I have been generously given a 20cm PushPan to try out for myself and baked a cookies and cream cake – read my review of the PushPan here. Imagine the cakes you could bake with this generous prize! You must be a resident of Australia to enter. You must leave ONE comment on this blog post. Follow Profiline PushPan on Pinterest for 10 extra entries. Tweet about this giveaway for 5 extra entries – this can be done every day until close of giveaway. 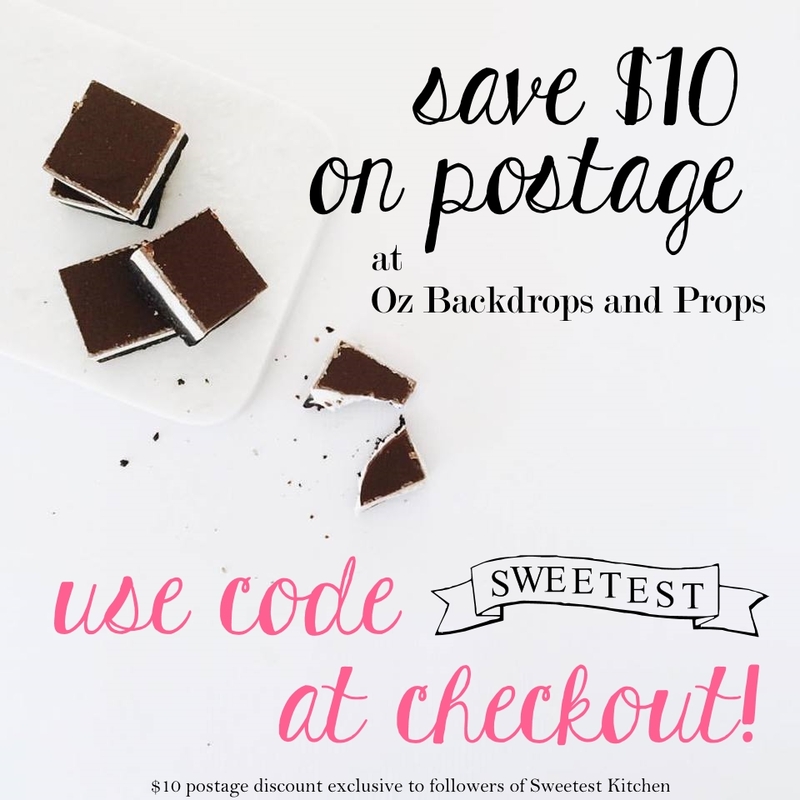 Like “sweetest kitchen” on Facebook for 2 extra entries. The giveaway starts today, Monday, 8th July at 11AM AEST, and closes Monday 15th July at 11AM AEST. The winner is chosen randomly and will be contacted by email within 2 hours of close of giveaway. Please use the Rafflecopter form below to enter the giveaway. My thirteen year old daughter and I will definitely be watching. We bake together all the time. I think I will watch a couple of episodes and see what it’s like. These pans look amazing! Would love to give them a try! Would love these. Would make Cake Friday (at work) so much easier. I am so looking forward to this show! I am so glad this show is finally starting! noooooo, the show’s starting on the day i’m flying away!!! No not starting to watch it , have started The Mole & I like that….Might record the first one & see if it’s worth while watching…. The pans look very good. It might be worth watching the show just to see how they work. I could really do with a set of these, so will be watching the bake off to see how they work. I’m definitely going to watch The Great Australian Bake Off, although I’m not sure I can handle the stress! I always get very concerned when their cakes fail or the cream splits. I totally feel their pain. To be honest, I wasn’t sure if I’d be tuning in. But with the cold weather settling in and needing a little more colour and warmth in my life, I think it might be just the cure for my winter blues. I would love to win this set! I don’t bake very often, and make the excuse that I don’t really have the cookware to do so…if I won this, I wouldn’t have any excuses. I love the idea and that would really help out my sparse baking kitchen. Innovative! I don’t like lining my pans and I looove the straight edges! This could work for me!!! Nancy has a really talent for baking… yet she’s so humble about it. I hope she goes far in the Great Australian Bake Off! I watched most of it last night. I really enjoyed it but had to go to bed as I was so tired, looking forward to the next episode. Loved the first episode of GABO. My mother would love these. I need to find some more out about them for her. I reckon my wife should have entered the show. She is such a good cook and would give anyone a run for their money. I haven’t watched the show yet, but I really think I should. These cake tins look fantastic, I’d love to win and try them out! I missed the first episode, but will definitely be watching it! Yes this show has me popping on an apron and dusting off my gran’s recipes! Can’t wait to see all the delicious treats that are made and hopefully pick up a few helpful tips too. Looks great! I would absolutely love these for my kitchen! I just learned about this and would LOVE to have one! Yes, I will be watching the show. Love the UK original. If its that good, will be a great show. What a great idea! I could see how useful they would be for savoury dishes too. Thank you for the chance to win the set.